Hello Everyone! I know this is a weird sort of thread to be here, but I am honestly super unsure where exactly else to put it. If this isn't in the right place, please let me know, I know this does have to do with character design theft with a past user. Supposedly, from what I know, Woodwirth(New DA)/PerrieChan (Old DA name)/yuyu-haya (TH) took one of Lupe's characters named Virtuas, renamed Minibit and then used them without Lupe's permission. Lupe made them a replacement, the new "Virtuas" (Now named Databit). However, when the character was transfered to me (Went through 2 owners besides Yuyu before me) Minibit/Virtuas was still attached. 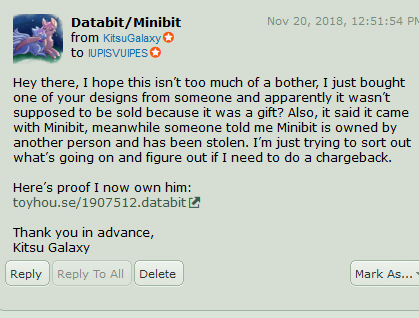 I just want to know if I legally own Minibit/Virtuas? Does anyone have more information on what happened? I don't want to be in possession of a stolen character if that's the case. Don't harass Woodwirth/Yuyu, it's a semi-old incident, I would just like answers. Edit: Here's the post with Virtua's/Databit's new design, it refers to something about a note being sent. Looking further into this. I'm really confused about this post. There's no one on toyhouse named total-human, so I assume you mean total-stranger? Also their style doesn't match up with the artist totalhuman on DA? I'm trying to understand what's happened. Minibit was made and then stolen by Yuyu. The original artist made Yuyu a new character to try and persuade the thief to stop using their character and Yuyu kept using minibit AND databit. The thief then sold the design to you? This whole thing seems super sketchy. This whole thing seems kinda hinky. If Minibit never belonged to anyone but Lupis then I'd assume the design is still stolen. Minibit was also added only minutes after the owner before you got them. I'd ask them about it if you haven't. I'd also hold out hope for Lupis to answer your note since they probably know the most about this. Until then you have more info, I'd set Minibit aside and not use them to be safe. SquidsInTheAttic Whoops! Totally meant to fix it so it was Lupe's correct DA acc. I'll fix that now. It's a super weird situation, apparently the character was only meant to be traded, not sold, but honestly what's been done is done with that. I now own the character, I'm stuck with the issue. He came with extra art so I'll take that as the reason why he was allowed to be sold. WolfieMun It's just a very odd situation and I don't want to use the character if I'm really not supposed to. It's just annoying that Lupe has never gotten back to me. I know she answers notes via DA, I can try contacting her on here and see if I get any luck. I totally get that she may be busy (I'm hella busy too) or she just may not want to even touch the situation again. If anything, you can try contacting uhhhh bbreakcore, rye-whiskey, or royalraptors on deviantart? I believe they have lup added on discord and would possibly be willing to ask about it for you! They're all very nice people if you do happen to need them to ask for you, I'm sure they'll understand!